Always thoughtful and moody, this was taken at the height of summer under a large elm tree. 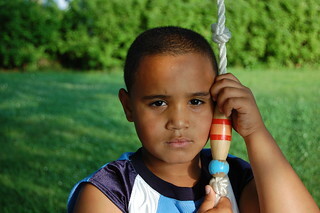 There is a lot of expression on his face and in the way he is holding the rope. The bright colors on the wooden handle enhance the darknes sof his skin and his expression.